The close season moves were significant; big central defenders Mark Schofield and Derek Goulding arrived and, along with the returning Alan McDonald, Kettle signed one of his former South Liverpool players whom he had long sought — goal-scoring winger Peter Withers. The repeat home defeat by Emley in the opening fixture was deceptive, a late tumround at Fleetwood in the next game heralding a run of eight successive victories. By this time Southport had also acquired the speedy front runner Steve Haw from neighbours Marine and when, late in October, the lanky yet cultured utility man Leroy Dove was secured from Buxton, the major elements of success were all in place. Back in August 1991 chairman Charles Clapham had announced a four-year plan to recover Football League status which involved gaining entry to the Vauxhall Conference by 1993. Few believed him but the single-mindedness with which he and the club now pursued this aim reflected tremendous credit on all concerned. Brian Kettle and Steve Joel — the latter now recognised more for his value off the field by his promotion to assistant manager in place of Les Blasbery — knew exactly what they wanted of the players and the players responded. Looking back it seems incredible that Southport not only stormed to the H.F.S. Loans League Championship with 96 points and well over Too goals but that they also managed to win two cup competitions along the way! Furthermore, an impressive F.A. Cup run took them through to the second round proper for the first time since 1968. It was a season of superlatives. By an astonishing parallel with the previous year, the early run of 20 League and Cup games without defeat again ended at Leek in November; yet again this sparked off an even more amazing run — the club record of 19 games without defeat dating back to 1955-56 was eclipsed as 24 consecutive League games passed before the team again tasted defeat, at Marine on April 12th. The very next game, over at Emley, brought the deserved triumph; Peter Withers scored a hat-trick in the 4—o win that sealed the championship amongst scenes of euphoria, just twenty years on from the winning of the Division IV title. team to a resounding 5-2 win over Chorley in extra time; and manager Brian Kettle keeping faith with Baines by ensuring that he brought up his moth League appearance for Southport in the last game of the season. Kettle, for his part, won the League’s Manager of the Month award on three occasions — September, October and February — though oddly he did not earn the accolade of Manager of the Season. 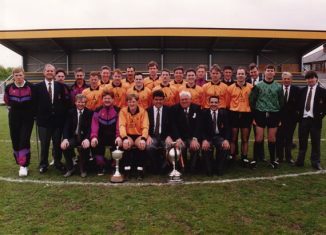 He did, however, receive the sponsor’s prize money, which was more than the club managed; of all the seasons to win the championship, Southport picked the one when the H.F.S. Loans company sponsorship had ceased and the club lost out to the extent of around £3,000! With the title won and the Lancashire A.T.S. and Liverpool Senior Cups safely annexed, the only remaining hurdle was to satisfy the Vauxhall Conference of the ability of the Haig Avenue ground to match its demanding criteria. The rigorous standards had been known since the first official inspection in January, when the Conference’s scepticism that the necessary work to ensure ground eligibility could be completed in time was barely disguised. It was at this point that Charlie Clapham came into his own; the plans had been drawn up for some time and the actual improvements were set in motion on March 1st. The transformation was astonishing; a brand new covered stand was erected at the Scarisbrick New Road end, new terracing complete with safety barriers was constructed down the popular side and at the Blowick end, and tarmac was applied to all remaining open areas. Around £250,000 was spent, part funded by a new share issue, and by the time the astonished Conference party returned on May 11th their final inspection had become a formality. All in all it was a tour de force for the chairman who had shouldered the responsibility for the whole project himself. The Vauxhall Conference held their Annual Meeting on May 20th at the Cafe Royal in London — ironically the same venue as that for the fateful Football League meeting back in 1978. This time the outcome of the voting was favourable; Southport were duly elected to membership of the Vauxhall Conference. It was the first step on the long road back.